Upptäck en ny rutt till kul med nya Zip 50cc. Utrustad med en fyrtakts i-get Piaggio motor som gör den miljövänligt och bränslesnål. Enkel, smidig och mycket lätt att köra. 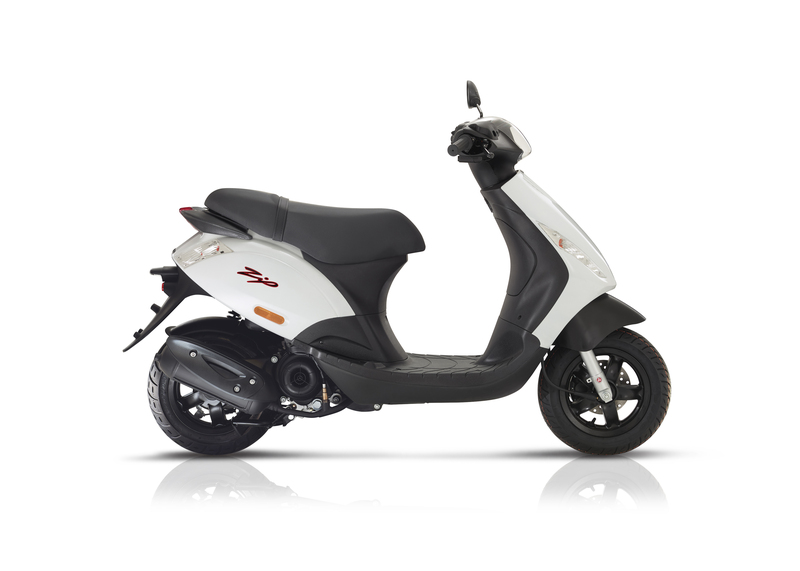 Piaggio Typhoon, a young, practical and fun scooter, has by now established itself as the Piaggio best-seller. Revamped in terms of aesthetics and technical content, it is now fitted with a new and brilliant 50 2-stroke Euro 4 engine with an electronically controlled carburettor. The new air cooled single-cylinder is a modern, ecological and quick powerplant, the best solution for a brilliant and fun ride in the day to day metropolitan jungle. Numerous upgrades allowed it to comply with the Euro 4 standard without detracting from the well-known features of rideability and practicality in all conditions. The fuel line benefits from a new, electronically managed carburettor: the fuel-air mixture is dosed out by a solenoid valve controlled by the engine ECU, which is also new, allowing for more efficient mapping. This is joined by an optimised cylinder diagram and a new exhaust line, now equipped with a double catalytic converter and double secondary air device. 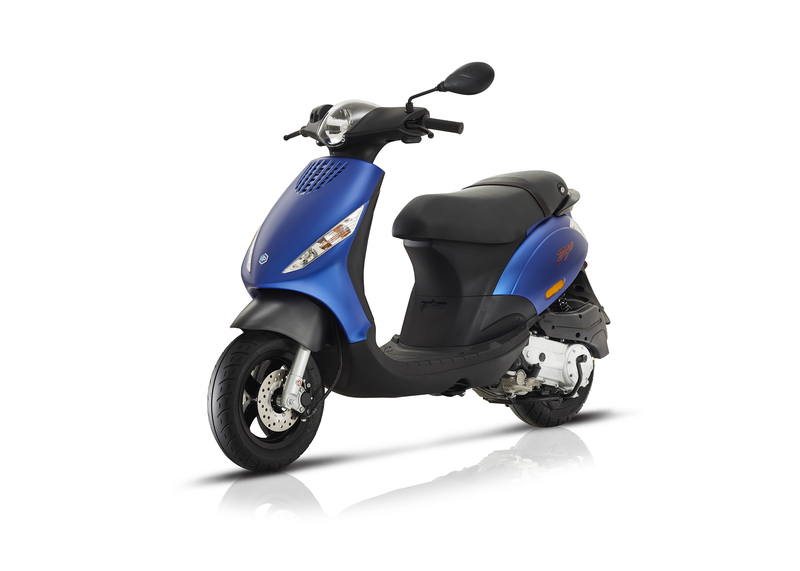 Piaggio Typhoon confirms itself as having a sporty nature, yet at the same time being reliable, functional and comfortable. The new analogue/digital instrumentation is loaded with information and includes an analogue speedometer, LCD display with total and trip odometer, fuel level indicator and clock. The series of indicator lights include: fuel reserve light, turn indicator lights, high beam indicator, oil level warning light and check engine warning light. 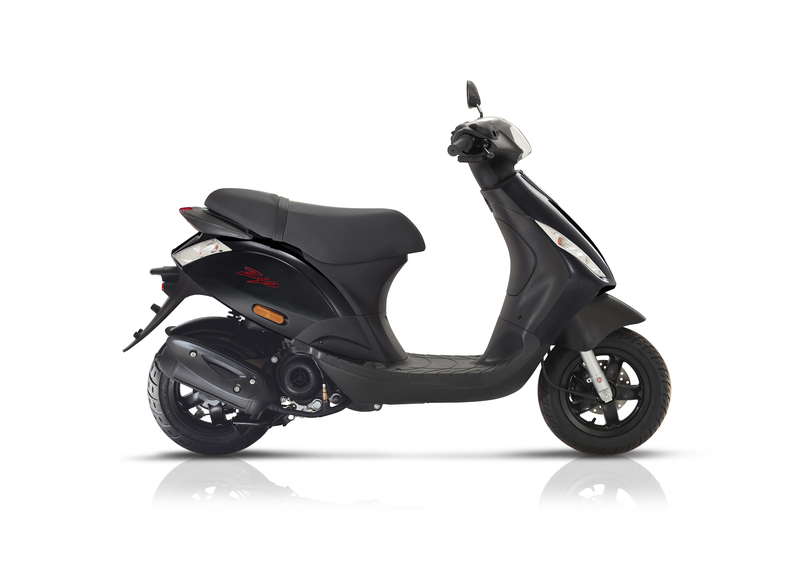 Comfort benefits from a saddle made of new material, enhanced with red stitching and the Piaggio logo. The passenger can also count on larger grab handles and dedicated, fold-away footrests. The gold coloured front brake calliper and the new exhaust silencer cover give Piaggio Typhoon an even more dynamic look and are a testament to the great attention to every detail. In the helmet compartment, spacious enough for a full-jet helmet, there is a very convenient USB port for recharging a smartphone or other mobile devices. 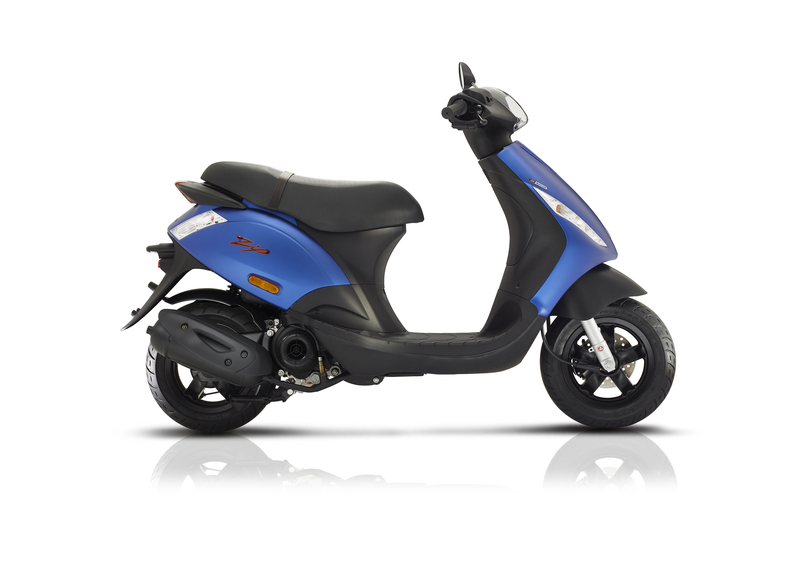 The front of Piaggio Typhoon boasts innovative aesthetic solutions: the “shark nose”, a distinctive trait of the young scooter from the Pontedera-based manufacturer, is imposing and large; the wide slots, a “must” on the Piaggio Typhoon, are spaced on the side of the leg shield to follow the profile of the new front light assembly, “the eyes” of Typhoon, aggressive and dynamic. The 12” wheel rims ensure better absorption of bumps in the road, as well as greater stability. Piaggio Typhoon stands out for its dedicated graphics: trendy and fashionable to satisfy the tastes of the very young or sombre and elegant for the adult public. Three colour schemes are available: Bianco Lucido, Nero Opaco and the new and original Verde Metallizzato. The modernity of the Zip design, characterised by complex surfaces that intersect to create simple and essential lines and by the balanced volumes, maintains a strong Piaggio “family feeling”. The front end is futuristic with its two “cuts” where the parking lights and turn indicators are nestled, the upper grille and the handlebar cover that are strongly characterised by the transparent “drop” that houses the powerful high beam and the dashboard, fitted with instruments and circular warning lights. The taillight assembly is also inserted in the upper profile of the side fairings. Large and comfortable for both rider and passenger, the Zip saddle conceals a spacious compartment for a full-face helmet and it can be easily adjusted to three different heights with an innovative “flexible” ergonomics solution which is the only one of its kind in today’s scooter segment. The handlebar controls are an integral part of the comfort and riding pleasure, accessible and intuitive, as well as more functional thanks to the automatic turn indicator return. On the leg shield back plate, there is a practical, locking glove compartment where you can easily and securely store documents and day-to-day items. Zip is also equipped with a highly practical bag hook. The passenger grab belt has a new look with red stitching, the same colour that is also used on the Zip badge. The frame, designed for the performance and stress of city use, is single tube with elements in high resistance pressed steel. The suspension system relies on a telescopic fork with 30 mm diameter stanchions. At the rear, the engine operates as swingarm, with a dual action shock absorber and coil springs. Braking is powerful and very modulable, ensured by a large, 175 mm front disc brake with hydraulic control and by a 110 mm rear drum. The engine in the Zip 50 4S Injection is an ultra modern four-stroke air cooled unit with electronic injection, fully compliant with the Euro 4 standard. Characterised by an entirely new thermal part and by the 3 valve timing system that distinguishes the i-get family (Italian Green Experience Technology), the new fifty is the result of a design that aims to maximise quality, reliability and implement an extraordinary reduction in consumption and harmful emissions. It is the perfect engine for the first vehicle of very young people who will surely appreciate its quickness combined with significant features of low operating costs, thanks to extremely low consumption. In terms of environmentally friendliness in the city, the usual stomping grounds for Zip, the new engine keeps noise to a minimum thanks to the development of new gearbox settings that allow the single cylinder to maintain quick performance while still being “docile”, in other words, at a lower average rpm compared to the engines in the previous generation. The result is a reduction in mechanical noise in addition to lower fuel consumption. Zip 50 4S Injection will be available in dealerships in the glossy colour schemes Nero Lucido and Bianco Ottico, as well as Grey Matt and Blue Matt. Zip can also be customised with optional accessories such as the rear top box, spacious enough for a full-face helmet, the windscreen made in high quality metacrylate and an extremely simple and convenient mechanical anti-theft device which anchors the vehicle handlebar using a securing system that is connected to the body.